Hidden Gem! Hidden Gem! Hidden Gem! Did we say hidden gem yet? The Kamloops may be one of the best-kept golfing secrets in all of Canada. 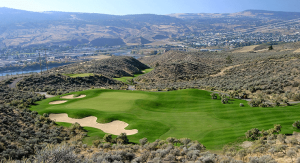 In the shadow of the Coast Mountain Range to the West and the Selkirk Mountains to the East, Kamloops’ warm dry climate, sagebrush hills and capricious winds make it a slice of West-Texas golf in the heart of the B.C. Interior. The Kamloops Dream Special combines the top-three courses as voted by the 2018 Golf Dream Contest entrants with two nights at the brand new luxurious Wingate by Wyndham Hotel. The courses that make up this special are as distinct as they are unforgettable. The Dunes is a links-inspired gem that has hosted the Canadian PGA Tour Qualifying School. Big Horn, with immaculate fairways carved out of the sagebrush hills overlooking the river valley, was named the “Best new course in Western Canada” by Golf Digest Magazine and Tobiano was named the “Best new course in Canada” by both Golf Digest and Score Golf Magazine. No other course in Canada has ever achieved such praise. Once you play it you will understand what all the fuss is about. Immaculate conditioning, challenging golf and a backdrop that sets it apart from any other course in Canada. Individually these courses are great. Together they make for a fantastic golf vacation! Prices are per person based on double occupancy and subject to applicable taxes. All packages can be shortened, lengthened or customized to suit your needs. Call us toll free at 1-866-723-2747 with your questions, to book or to request other package options! BC Golf Safaris is a full service golf booking and reservation agency. We specialize in arranging golf vacation packages to golf courses throughout British Columbia. © Copyright 2019 BC GOLF SAFARIS. All Rights Reserved. Website by The Web Advisors.